Thirty? Thirty. Three, Zero. 30 in thirty days. This really is a challenge, especially for someone as new to painting as I am. I got to thinking… after thirty paintings, in thirty days, I won’t be so new. I’ll be more practiced and all because I decided to jump in with both feet and take a leap of faith. So that’s it friends. I’m doing it. I’m taking the challenge to do Thirty Paintings in 30 Days. 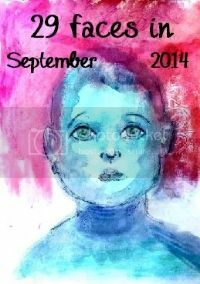 One painting for each day in September. You could join me if you like. You’ll find all the details HERE. I am also taking part in 29 Faces in September 2014. Insane! Not really, I can combine the two, because I really do like painting faces. There are some AMAZING artists taking part in both challenges. I thought it might be intimidating to be among such talent, but it’s not. It’s inspiring. So here I go, with my beginner brush strokes and messy fingers. My theme is simply to paint, keep things simple and to enjoy it. This was a fun piece to make. It’s an ‘upcycled’ magnet, one of those cheap adverting magnets that come in the mail or on telephone books. Surprisingly, they make fun little canvases. Instant fridge art, that holds itself up. She looks lonely. I’ll have to do more. I gessoed the surface of the magnet and then painted with acrylics. 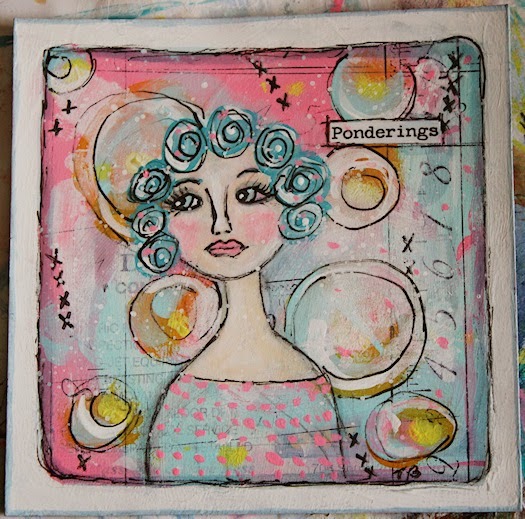 I allowed a bit of the original magnet to show through in spots and added a few stamps, then more acrylics over top. Black detail work done with Pitt pens. 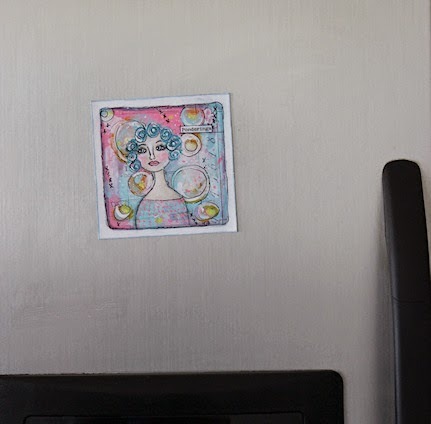 Posted in 29 faces, Creative Every Day, mixed media, mixed medium, Thirty Paintings in 30 Days, Tori Beveridge and tagged 29 Faces in September 2014, fridge magnet, girl art, painting, Tori B, upcylcle art. That's a great idea and looks totally cool. SO GLAD TO MEET YOU TODAY TORI! 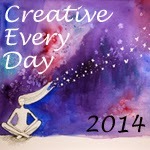 Your art stood out to me in the liine-up today on Leslie's blog. So I checked out your blog and I'm glad I did! LOVE your mini-canvas magnet! YOU GO FOR IT GIRL! I"m a challenge veteran and I'll be cheering you on!